When fall rolls around, I’m always so ready for a change. From the crispiness in the air, cozy sweaters to wear, to the change of colours on leaves and trees, and last but definitely not least, the food. If you love to bake, cook, love to eat, or just have a deep appreciation for good food, you’re reading the right post today! I am going to share with you a special treat. This easy vegan soup recipe makes the most delicious vegan carrot chili and cilantro soup. Do you get bored with the food you make and need a little inspiration from time to time? I certainly do, because I am less of a cook and more of a baker. Usually, one is a very good cook and a mediocre baker or a very good baker and a mediocre cook. Which one are you? My hubby loves to cook because cooking tends to be more flexible than baking. I love to do things in a particular order, have the temperature just right, not taking all sorts of liberties, or changing essential ingredients. It works great for us and gives us a good balance. I digress, let’s get back to this carrot chili and cilantro soup. Now that Autumn is here, I tend to have lots of different soups either at lunch or for dinner. Homemade soup is great because there are endless options to choose from. The recipe below is for a soup that needs only 15 mins of prep time. The rest of the cook time is to let the carrot chili and cilantro soup heat up and let you breathe in the delicious aroma. It requires little effort. Before we get started, I need to mention that I have shared this recipe with a group of four girlfriends, two asked me what the difference between leafy cilantro and coriander is. Let’s get that explanation out of the way, and get you cooking. Both come from the same plant, however, they have very different aromas and flavors. Often times people are shocked to hear this as both are entirely different. Cilantro is a herb often used in Asian and Latin American cooking. It has a citrusy, zest, upbeat flavour, while the coriander seed is sweet. Garnishing it with a healthy dose of sautéed red bell peppers and red onions gets even more veggies in there, for a full meal. In my opinion, one of the most versatile herbs, cilantro adds a wonderful and distinctive flavor to salsas, soups, stews, curries, fish, chicken dishes, and even salad! The first time you make this, I suggest making it as a side to a meal, if it doesn’t turn out the way you want it to. When you have perfected it, have it for lunch or dinner as a meal. It is filling and you won’t be left hungry. How Long Is This Going To Take Me To Make? Heat the tablespoon of olive oil in a large pan over medium heat. Next, add the garlic, cilantro and chili paste. Saute with the onions until they are tender. Stir in the chopped potato, then cook for only 1 minute. It shouldn’t overcook. Add your peeled and sliced carrots to the vegetable broth, and bring to a boil. Reduce the heat to the lowest level on your stove. Depending on your palate, you can add lemongrass and zest here. Cover and cook for 20 – 25 minutes until the carrots are tender. Tip into a food processor and mix until it’s smooth. Depending on the size of your processor, you may need to do this in two batches. Final Step: Return everything to your pan. Taste it and add a pinch of salt if necessary and let the soup sit for 3 minutes. You may want to reheat slightly if you like. Otherwise, let it rest, and only reheat when you are ready to serve it. Ladle into bowls and top with a swirl of reserved coconut milk. The coconut milk will give you that extra creamy texture and rich flavor. That’s it, it’s a done deal. Easy peasy right? It is always a great idea to add fresh herbs to your soup recipes to infuse the dish with aromas and flavors. When the effect you seek is light, subtle, refined, and delicate, just add a hint of herbs. If you need stronger aromas, use handfuls. Mint is extremely versatile and can be used in both sweet and savory dishes, rather than as a simple garnish. Thyme comes in dozens of varieties and pairs well with rosemary, parsley, and oregano. Leftover soup? I have the answer for you. In a pan with the lid on, gently cook the chopped carrots in a little butter and 1 tbsp of water for 30 minutes until they are softened. Pan sear a half of red pepper until it is lightly charred. Leave in a plastic bag for 10 minutes, then ,peel off the skin and remove all the seeds. Add your pepper and carrots with just one tablespoon of red wine vinegar to your mixer, and mix until it is smooth. Serve the delicious purée with chicken or lamb chops. Loosely wrap herbs in a damp paper towel and seal in a zip-top plastic bag filled with air. Refrigerate for up to five days. To revive and give life back to limp herbs, trim 1.5 cm off the stems, and place in them in ice water for a 2-3 hours. Wash herbs just before using; pat dry with a paper towel. Overheating can completely kill the flavor of fresh herbs, so add them to your dish at the end, or heat on low. 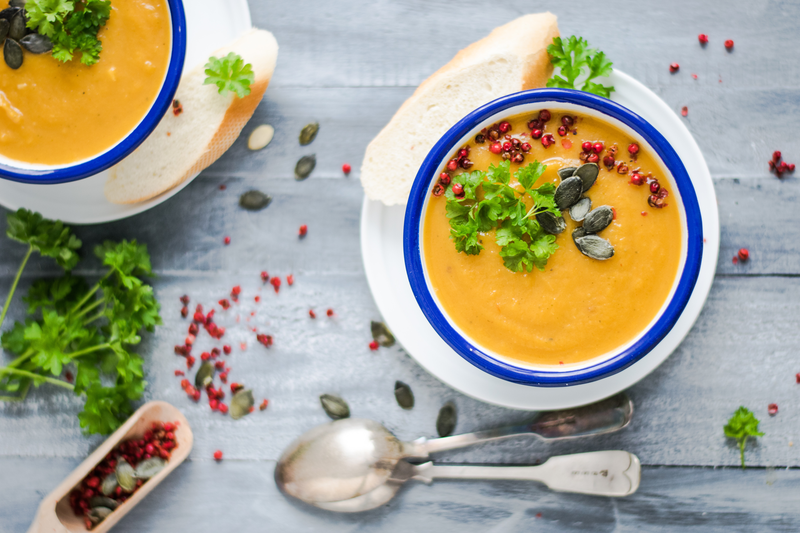 Have you tasted a carrot chili and cilantro soup? If not, I hope this recipe will inspire you to make one soon. I’ve been meaning to comment on this amazing soup recipe of yours for weeks now, but only got to it today… I wanted to thank you for sharing a Vegan recipe, that everybody can enjoy ♥ I love how you and your husband are balanced in the kitchen: the very good cook & the very good baker. I’m both cook and baker in our household, not sure if I’m in the mediocre or ok range but I do have fun creating in the kitchen, that’s for sure 😀 But at least for today, I know what I’ll be making: your soup ♥ nothing better than this on a cold, frosty day like today! This carrot chili cilantro recipe looks so rich. I love anything carrot or cilantro. My husband’s sister is celebrating her birthday this weekend and we have to take something with us. I’ll have to try and remake this for her. The kids are out of the house this weekend. Should I be excited about that Sheri? I am having a date weekend with “him” so this could do for a nice light dinner surrounded by candlelight. You are the bestest. Have a great weekend sugar plum. For some reason, I was expecting to read about something I could do for my mental health and peace of mind on here today, but glad you are showing me something TO DO. This is great. We all love soups and will give this one a go. Hey Sheri, this is a recipe I have not made but excited to try. I have been thinking about what to make for dinner tomorrow night and might end up trying this one. I will let you how how it turned out. let’s hope for the best.